Great B and L taste, which is all you want from a B and L e-liquid. You get a great taste and the level of nicotine that you choose. This is marketed as 'B and L' for legal reasons. 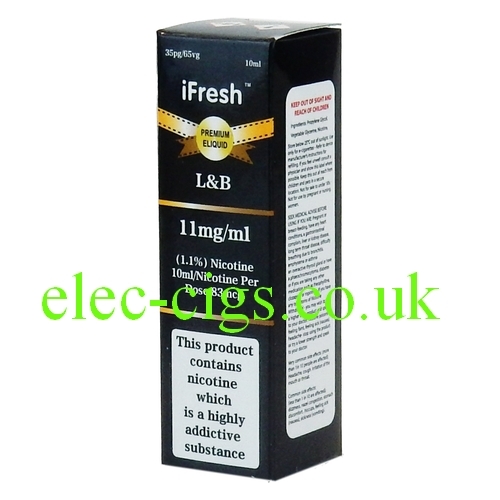 This B and L iFresh Premium E-Liquid is available in five nicotine strengths, which are: Zero (0%), 3 mg (0.3%), 6 mg (0.6%), 11 mg (1.1%) and 18 mg (1.8%). As well as being great e-liquids they are priced very competitively too. Made by the same manufacturer as several of the leading brands it should shake the market because of its high quality combined with ultra competitive prices.